A girl's closet is never complete, but I was content with mine until I saw this. I have my brown and black faux furs and nothing in me has ever wanted any fur more. Please be aware once you see this you will be on the hunt. You could put this coat over a paper bag and you would still be the best looking person in the room. 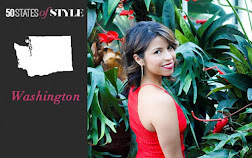 A dear blogger friend of mine MidTown Girl interviewed me for her "Single Girl In The City Series" - It made me really think about my single life and how wonderful Seattle really is. You can check it out here. lol! "You could put this coat over a paper bag and you would still be the best looking person in the room. " Wow!!!!! Just when I thought I was done with my fall shopping you have to tempt me! I don't my wardrobe will be complete until I have those leopard hot pants. I am afraid to wear a big coat like this, but I think you have inspired me to try it! That coat is hawt! And not just because it will keep you warm! Nice to meet you lady. Wow love the coat and the overall look!very hot!! i saw this pic yesterday and was just in awe. so beautiful.